Detailing the physical features, habits, territorial reach and other identifying qualities of the Striped Blister Beetle. The seemingly harmless Striped Blister Beetle has a secret chemical weapon that it uses on bugs and people alike. When threatened, this yellow and black blister beetle secretes an acidic yellowish fluid onto its legs. Predators and people that touch this caustic fluid are burned by it. People may immediately see blisters form in the area of contact. The Striped Blister Beetle has a yellow head. The wing coverings are yellow with two black stripes on them. Closely related beetles look similar, but have a different number of black stripes. Adults eat potatoes, tomatoes, and other garden plants, making them a potential pest to backyard gardeners. Many of them may inhabit the same plant. Their habitat includes gardens, parks and farm fields. Beetle larvae feed on buried grasshopper eggs and spend winter underground. 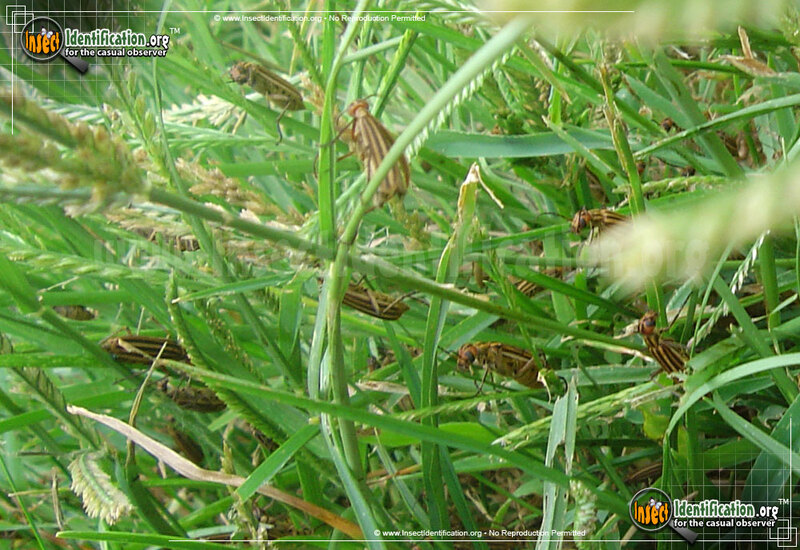 Their diet keeps crop-destroying grasshopper populations in check, making them beneficial insects to have around to farmers and backyard gardeners, if direct contact can be avoided.